we are a very small business. Mr & Mrs + some helpers (growing number). we love to get into nature, do a bit of exercise, then kick back after a hot shower with a good wine, good fresh food, good friends, the right ambiance, and preferably in or near nature. our tours are made for people like us. we will make YOUR tour YOURS. Let’s talk about what that looks like. on Day #1 most people drive to our place at Kiah (11.67km south of Eden on the way to the National Park) and leave their car in our shed before being transported to the start of the walk. We’ll relieve you of your large bags here. 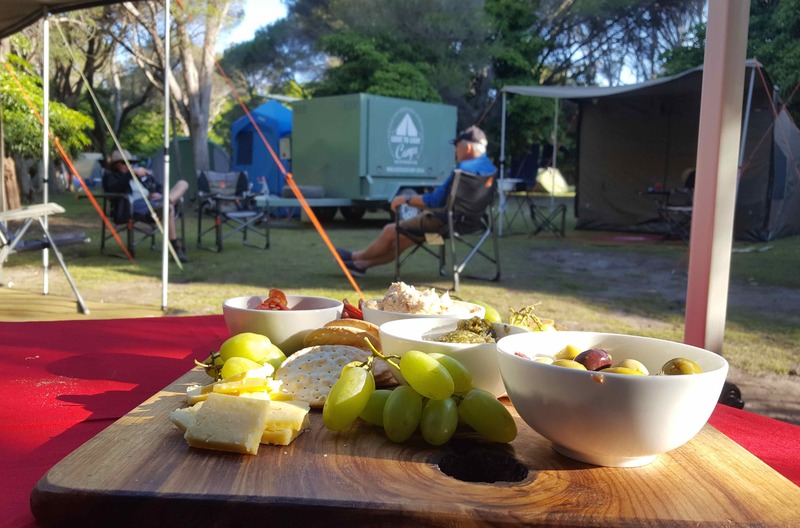 you’ll arrive into a fully set up luxury camp with all the comforts you’ll need: good quality supportive chair with foot rest, drinks/nibbles and a campfire, a hot shower and then a delicious freshly prepared meal. we’ll wake you around 7am to partake in a healthy breakfast before we sort our your lunch and ensure you’re ready for the day’s hike. Hand held ResQ Link Personal Location Beacon. All National Parks camping and visiting fees. Twin share in OzTent RV-5, on a comfortable padded camp beds, topped with an OzTent mattress, fully lined OzTent sleeping bag and crisp white fine cotton percale sheets. Thick, fluffy white bath sheets, flannel face washer, and Pure Herbs shampoo, conditioner and moisturizer. + 1 night in Green Cape Lighthouse cottages for tours #2 and #3. Lunch and snacks – 3 days. Nibbles and a hearty dinner, cheese platter or sweets – 2 nights. Drinks with dinner – please speak to us about your preferences. Additional available for purchase. Lunch and snacks – 2 days. Nibbles and a hearty dinner, cheese platter or sweets – 3 nights. Nibbles and a hearty dinner, cheese platter or sweets – 1 night. Tour Guide – please note our basic tours do not include a Tour Guide, however we provide a full briefing, updated Light to Light Walk map and comprehensive Map Notes. If you require a Tour Guide, we have a number of experienced Guides available at an additional cost of $400 per day per group. Tour bookings are reliant on our ability to secure our preferred campsites at Saltwater Creek through National Parks & Wildlife Service. Their campsite booking system requires us to confirm and/or cancel booked sites 30 days prior to the booked date. As we wish to accept bookings up to 14 days before our tours commence, please note we must confirm availability of sites to ensure we can run the tour on your preferred dates. 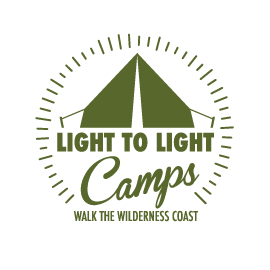 If you wish to book a tour less than 30 days from commencement date, please contact us via email: bookings@lighttolightcamps.com.au or phone 0429 961 047. We will then confirm site availability and respond to you immediately. Walking shoes or boots – preferably worn in for comfort. T-shirt and long-sleeved top. Go for quick-drying fabrics such as lightweight merino. Keeps you cool and dry, but is also a very effective barrier against the cold. Layers are the best. Sunhat or cap, beanie and gloves for cool nights, walking socks, comfy soft shoes for around the camp. Whether it’s star-gazing, bird-watching, fishing, Aboriginal history, or marine science, if you have a special interest you’d like to explore while in the region let us know. We can work with you on ways to make sure your Light to Light experience is designed specially with you in mind. The tour is best suited for ages 8 and up. But if you have young children and would love to bring them along, talk to us. We’re flexible and creative, and might be able to offer a solution that works for both you and your youngsters. Ahead of your tour, we’ll be watching the weather forecast closely. If a tour is cancelled by Light to Light Camps due to unfavourable conditions, a full refund will be provided. 30 days or more prior to tour date – full refund of deposit paid plus any booking or cancellation fees imposed upon us by National Parks & Wildife Service. 14-29 days prior to tour date – 50% refund of deposit paid plus any booking or cancellation fees imposed upon us by National Parks & Wildife Service. up to 13 days prior to tour date – no refund of deposit paid. If you have any questions about any of the above, just ask. We’re very friendly! Email Jenny Robb at jenny@lighttolightcamps.com.au, or call 0429 961 047.